Earlier this week, I wrote about visiting Istanbul's Grand Bazaar with kids. We loved our tour through the bazaar, but I was mindful of the fact that those shops are heavily touristed (though many also serve wealthy locals who can afford fine gold jewelry, rugs or other traditional items). The area around the bazaar is in some ways even more interesting, if less pristine. Just look at the riot of colors on this street leading away from the bazaar. 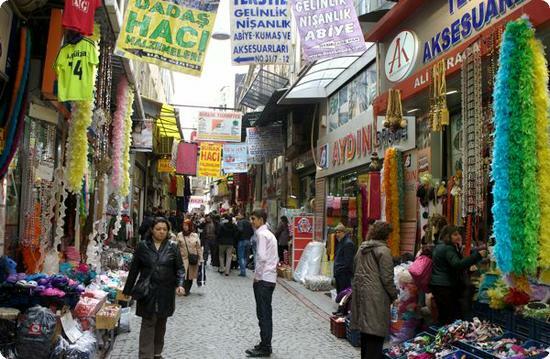 One of the streets leading to Istanbul's Grand Bazaar. This is where the locals really shop. Myscha Theriault on June 25, 2010 at 6:11 a.m. Thanks again for another great Photo Friday.